Product prices and availability are accurate as of 2019-04-23 02:51:36 EDT and are subject to change. Any price and availability information displayed on http://www.amazon.com/ at the time of purchase will apply to the purchase of this product. Often referred to as Ritha, Aritha, Reetha or Soap Nut Hair Powder. Commonly imported and marketed as hair washes and scalp treatments treatments. Pure Soap Nut Powder has its origins as an ancient Ayurvedic herb for personal cleansing and hair care (even anti-hair loss) treatments. Only in recent years has its full power as a safe, green household detergent and cleaner been recognized in the US market. 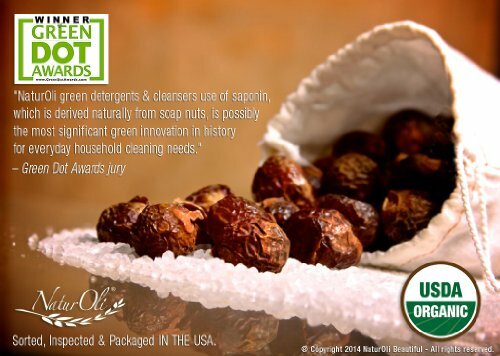 Soap Nuts are redefining the meaning of "green" cleaning. NaturOli, is the #1 selling brand in the USA and has been twice recognized by the prestigious Green Dot Awards! Acclaimed as, "Possibly the most significant green innovation in history for everyday household cleaning needs." And further proclaimed, "A consumer guide to excellence in environmentally-sustainable practices. A business that can be trusted by consumers with stewardship of the environment." #1 selling brand IN THE USA! ---- Finely ground from fresh de-seeded, wild-harvested, all-natural organic soap nuts / soap berries ---- NOT CHINA GROWN! ---- No chemicals, pesticides, industrial pollutants or contaminants. ---- USDA Certified Organic* Sapindus Mukorossi! ---- *USDA is the official Organic Certification for products grown or packaged and sold in the US. Amazingly versatile! ---- Use "AS-IS" for 100% natural laundry detergent, household cleanser, hair & scalp care treatment, pet care, or general personal hygiene. Ideal as a base surfactant (soap) for making your own green, personal care products, hair care & shampoo treatments, laundry detergents or household cleaners. ---- NaturOli products are produced & packaged in the USA! Commonly referred to as Ritha, Reetha or Aritha powder. An Ayurvedic herbal ingredient / treatment. ---- Highly effective yet gentle for skin & hair. Used for ages as a rejuvenating treatment of premature hair loss, dandruff relief, itchy scalp. ---- Fabulous for non-toxic pet grooming (shampooing or dusting for flea & pest removal). Leaves coats beautiful! A superb scouring powder! Say goodbye to toxic Comet and rubber gloves! ---- No fillers or additives: Safe, chemical-free, fragrance free, eco friendly, hypoallergenic, biodegradable, anti-fungal, anti-microbial. A natural insect & pest deterrent. 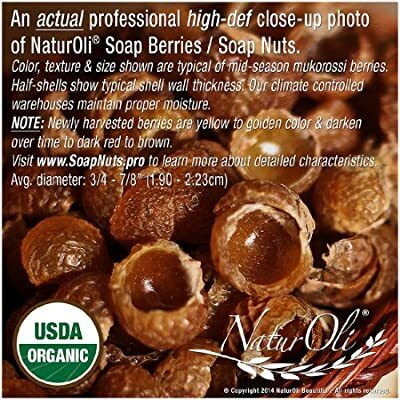 ---- ALSO SEE: NaturOli Organic BULK Soap Nut Powder in 8, 16 & 32oz sizes! ---- Search: "NaturOli Soap Nut Powder". 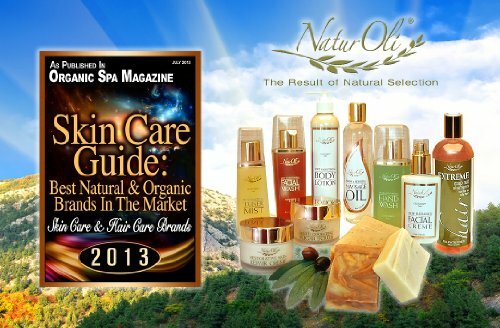 ---- Find more NaturOli products (including Combo & Variety Sets) at our Amazon Store: www.Amazon.com/NaturOli PRESS: 2014: Organic Spa Magazine selects NaturOli for the "2014 Skin & Hair Care Guide: "BEST Natural & Organic Brands In The Market" ---- 2012: (LA Times) NaturOli Soap Nuts selected as a "TOP 4" gray-water safe detergent! Plus ties for #1 for lowest cost per load! ---- 2009-10: (Los Angeles, CA) Two-time Green Dot Award Winner: Proclaimed, "NaturOli's work with saponin, derived from soap berries, as possibly the most significant green innovation in history for everyday household cleaning needs." ---- 2011: (Washington, DC) Environmental Working Group & Safety in Cosmetics announce NaturOli as "CHAMPION" - one of only 311 elite companies worldwide.